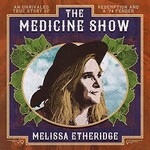 With The Medicine Show, her 15th studio album, Melissa Etheridge brings it all to new levels of artistry. The songs of The Medicine Show are inspired by acts of kindness, love, resilience and bravery on all levels. "Human Chain," with its Memphis soul vibe, is of people coming together to help one in need. The album-closing "Last Hello" draws on the incredible strengths and courage shown by the survivors of the Parkland school shootings. Other songs take a look-in-the-mirror stance about overcoming a wide range of challenges and adversities, of rising above with equal measures of love and fortitude.